At Joffe, we partner with schools across the country to assist them in a journey to safety self-reliance. One way we do this is by providing security programs, including on-campus daily security guards. Because of this, a lot of our resources and content on the topic of school security (of which you can find links to below) is directed towards school administrators, faculty, and staff. Of course, these groups are hardly the only stakeholders that think about school security or will be affected by a change in it. Parents want their children to be as safe as possible when on campus, and so naturally many are considering whether a school should add an on-site security presence. This article is for all the concerned parents out there who think their child's school would benefit by adding security guards. We've compiled the best ways to approach school leadership and maximize your chances of successfully getting your child’s school to at the very least consider school security. Find the Right Moment: A lot of our online resources devoted to schools and their employees note how busy they are on a daily basis. This is true! Before the parents reading this hastily navigate away from this article, we at Joffe know you work just as hard. I raise this point solely to note that the drop-off line before school, for example, may not be the best time or location for a serious conversation (at least one with any chance of success). Everyone involved in a spur-of-the-moment chat like this is thinking about the next five immediate tasks in their day, not long-term safety concerns. Do your best to schedule a meeting where both parties can give the discussion topic the careful thought and consideration it deserves. Bring Data: The more, the better. According to US News, around 57% of schools now have some form of in-person security on their campus, and the number is only expected to rise in the future. Research the affordability and reputation of security companies in the area to head off the inevitable cost concern. Visit our page here to learn about Joffe’s vision for committed, compassionate, and focused security guards that bring much value to any learning environment. Many decision-makers respond best to cold, hard numbers. Consider their value when in pursuit of a worthy goal like this one. Find Out How You Can Help: You scratch my back, I’ll scratch yours? I’ve never really subscribed to the reality of this common phrase (I’ll scratch my own back, thank you very much), but the core sentiment is smart. Look for ways to be of value to whomever you’re trying to convince, and use that as a stepping stone to your ultimate goals. Like we said earlier, school employees are usually balancing around ten things at any given moment. You’ll be able to help out somewhere. Practice Patience (But Be Honest): Schools aren’t always quick to respond. Much like an ocean liner, it takes the alignment of priorities and a shared goal in order to move in a new direction. If the goal is to get security guards placed at your child’s school, know that it probably won’t be an immediate change. Multiple stakeholders in the school will want to weigh in with the positives and negatives, and big changes like this can only really be implemented during summer vacation or perhaps spring and winter break. At the same time, be blunt with the people you speak with. On-site security is one of the most effective ways for a school to be prepared for a multitude of scenarios, and are a great resource for faculty and staff. Make sure that point is made obvious, leaving school administrators with a clear path forward and understanding exactly what you expect for your child. School communities and parents are partners who need each other. That’s the simple truth, and their primary shared goal (providing the best possible environment for children to learn in) will always be a powerful reason for them to work together. However, these are separate groups with disparate experiences and perspectives and this can cause friction or wariness between the two parties. It is a delicate act to convince a school that your opinion is right, and following our tips will increase your chances of success. The last thing we'll say on the topic? A cliche I do subscribe to is "Strength in Numbers." If you can gather a group of committed individuals in pursuit of your goal, I pity anyone who stands in your way! Why Hire School Security Guards? Did we at least pique your interest? 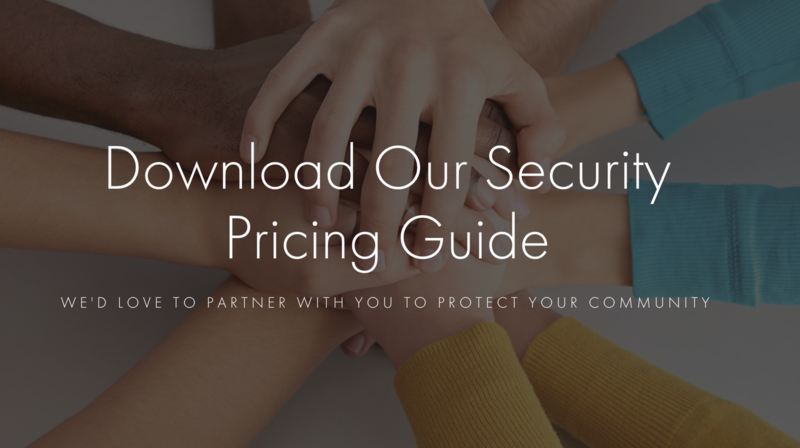 If you'd like some more concrete data, download our security pricing guide below.